This is my review of SiteGround and its web hosting service after I have been their customer for over six months. 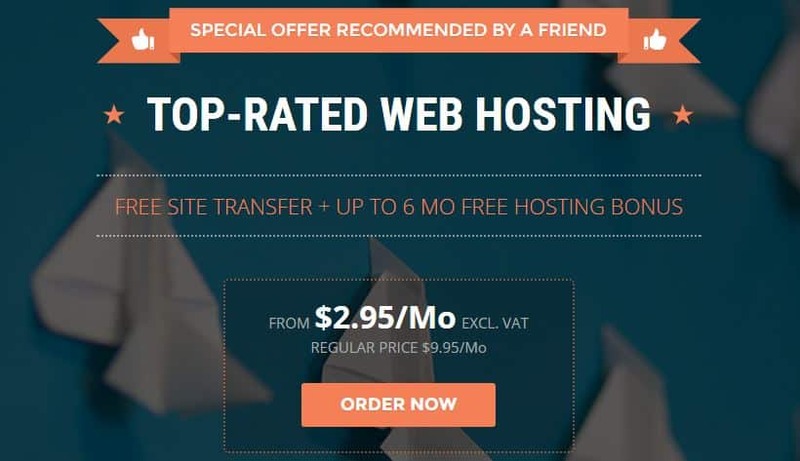 I will highlight the differences between SiteGround and other popular alternatives like BlueHost, HostGator, iPage….. and it will soon be clear how SiteGround beats all the other standard web hosting companies. SiteGround has 3 distinct plans – StartUp, GrowBig and GoGeek. GrowBig and GoGeek can be assumed as “premium shared hosting” because of the additional perks that they offer. If your website needs more resources, SiteGround also provides Cloud hosting, managed Dedicated Servers and then Reseller hosting. StartUp plan only allows 1 website per account and is suitable for ~10,000 monthly visits. For clarity, 1 visit equals access from 1 IP address over 24 hrs time. If the same visitor accesses your website 20 times in the same day, that counts as 1 visit. If you are just starting out, with just 1 website, StartUp plan is a good choice. 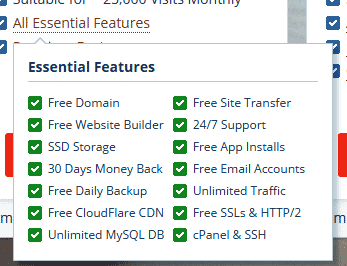 It comes with 1 free domain, unlimited traffic, free SSL & HTTP/2, unlimited MySQL DB, SSD Storage, Email, CloudFlare CDN, Free daily backup, etc. GrowBig plan is my personal favorite and the one that I am using right now! It allows hosting of multiple websites, and is suitable for ~25,000 combined monthly visits. However, if you use the CloudFlare option (included free), the limit is probably 100,000 visits/mo. CloudFlare caches the website’s data, reduces calls to the web server and also speeds up the website load time. This plan comes equipped with SiteGround’s SuperCacher software-hardware custom feature that boosts speed and handles simultaneous website requests in spectacular ways! The SuperCacher is the reason why I chose to use SiteGround and have been pleased with the performance gain ever since. GoGeek plan is what I might use when my website grows out of proportion. It is suitable for viral websites and resource hogging web-applications. 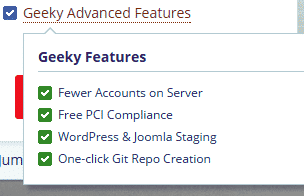 It has every feature of the GrowBig plan, PLUS the Geeky advanced features (see the image attached). I would still recommend the GrowBig plan over GoGeek if your websites do not need these extra features. Why pay for extra when you can get the best out of the more affordable plan? I have hosted many WordPress websites on Siteground. 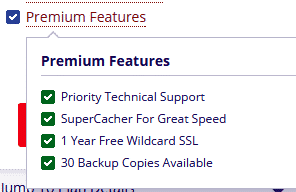 Their custom SuperCacher plugin is not just a WordPress caching plugin. The SuperCacher provides 3 levels of caching: Static Cache, Dynamic Cache and MemCache. Dynamic Cache: Dynamic caching is the second layer of site performance improvement. It creates copies of your website’s dynamic content and stores them in the server RAM. MemCache: The Memcached technology speeds up database calls, API calls and page rendering by storing data and objects in memory to reduce the number of times a database is queried. SiteGround also provides 1-click CloudFlare free integration so you don’t have to do it on your own. I saw a huge website speed gain as soon as I switched to SiteGround. I wish I had purchased it for 2 years instead of just 1. They give you 60% Off discount on your first purchase so I recommend anyone to pay for 2 or 3 years upfront and get the 60% discount on the entire price. You can use this link to activate the 70% Off coupon. Siteground also allows you to host your email, aka webmail, however I am using Zohomail (3rd party service) to host my emails outside. You also get 1 year of free SSL for your websites at SiteGround. The support team installs it for you. They even take care of your website transfer. On the GrowBig and GoGeek plans, you are free to have as many addon domains as you want. I have hosted 6 websites at once and all my websites still performed without any glitches. Siteground’s support is amazing. They responded to my emails within 5 minutes. I also received a phone call once because they wanted to make sure my problem was resolved. I am also satisfied with their pricing. It is a bit pricey than alternatives like HostGator or iPage however I am glad I chose SiteGround and not HostGator. This is the best place I can host my websites on shared servers and still have those VPS server caching features + kickass pageload speed. SiteGround does not provide a VPS per se but it has Cloud hosting and managed dedicated server hosting options if you may ever need them. The GoGeek plan is essentially a VPS plan. I feel like SiteGround is one of those places where you find perfect balance between price and service. Their service is top notch and website loading speed will be fast. You will not run into tech issues. Even if you do, they offer great support. Some great competitors: GetFlyWheel, WpEngine, MediaTemple offer the same level of features for double the price. At this point, I cannot think of any alternatives if you do not want to go over the budget. SiteGround delivers more and costs less. If you want to host multiple sites on same account, want each of them to be FAST (with hardware-level caching), have automatic daily backups, free SSL, top-notch support, free website migrations – SiteGround is perfect. I’d specifically recommend their GrowBig plan because I am using that one too and I like it. Thanks for your input Julie. I agree, SiteGround is perfect for what it is!